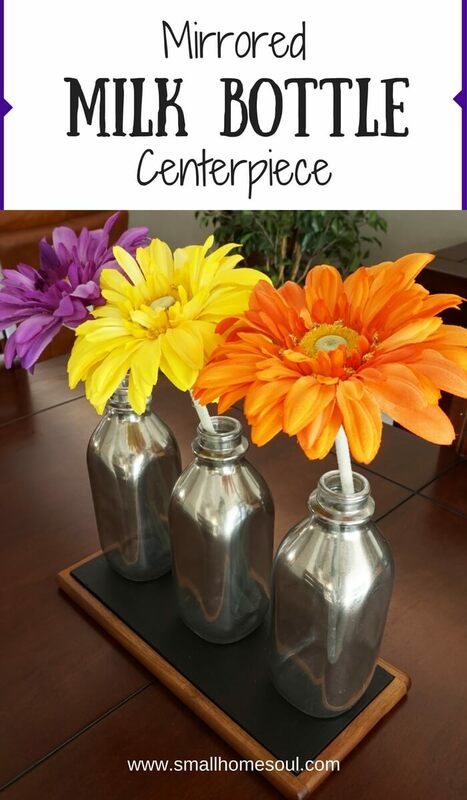 Mirrored Milk Bottle Centerpiece - Easy Spray Paint Update - Girl, Just DIY! Hello friends, after I finished my Master Bathroom Makeover we went on a little vacation and I’m just getting caught up. 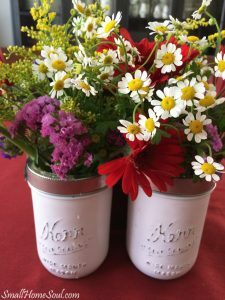 We had lots of fun but today I’m happy to back and share with you all a super easy Mirrored Milk Bottle Centerpiece I made a few weeks ago. 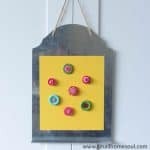 It’s an easy project that you can make with any bottle or jar you have on hand. 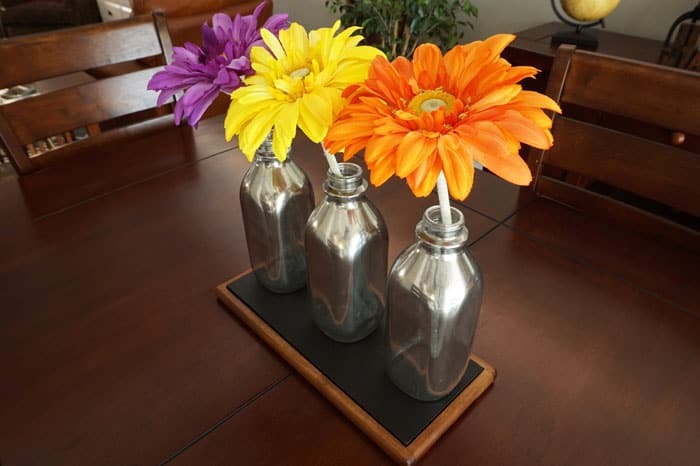 Just add some some fresh or faux flowers and you’ve got a beautiful centerpiece for your table. Today I’m also going to tell you about a tool that every DIYer and crafter needs to add to their must-have tool list. It’s this Popup Spray Shelter by HomeRight. 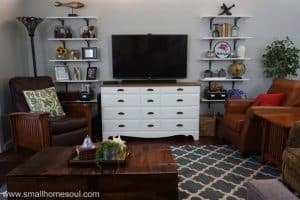 HomeRight has generously sponsored this post by providing me with the spray shelter to use for this project. Even though this is a sponsored post all opinions are always my own. This post also contains some affiliate links for your convenience. You can read my full disclosure here. Seriously, you need one of these spray shelters for yourself! It allows me to do light painting inside my garage or outside on the lawn. It’s always windy at my house and I lose a lot of spray paint to the wind; this spray tent solves that problem. 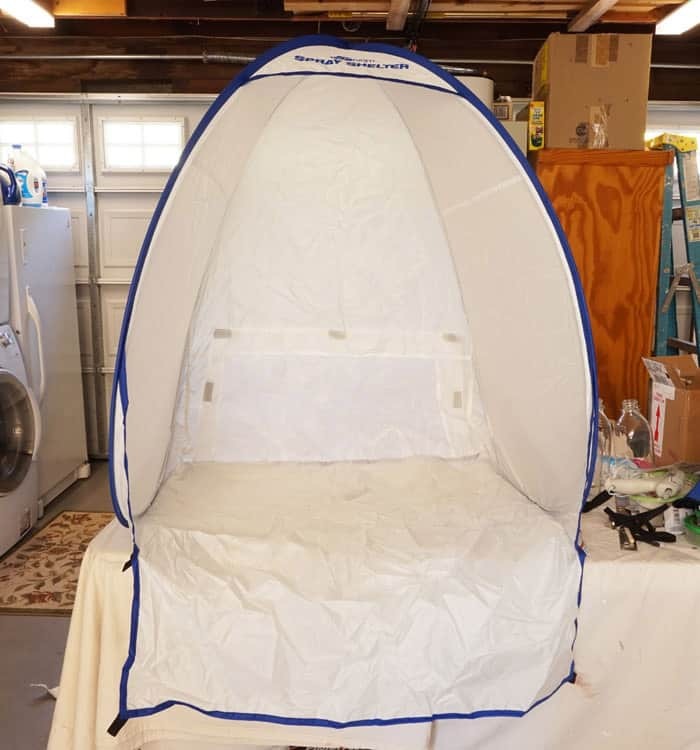 The Spray Shelter looks big but it’s only about 36″ tall making it perfect to set on top of a work table. And you can see at the back in the picture above there’s a flap for accessing the back side of larger paint jobs. It also folds up quickly and fits into it’s own zippered bag for easy storage. The folding instructions are stitched to the bag so you won’t lose them. If you follow the folding instructions you’ll be all set. If you choose not to follow the easy instructions you might just find yourself on one of those videos of the frustrated parents trying to refold their kid’s popup fort 🙂 You don’t want to be that person now, do you? Setting up the tent takes about 5 seconds, no kidding. The cardboard box the tent came in worked perfectly to elevate the bottles a bit. I forgot to take pictures while I was spraying the bottles but I just stuck two of my gloved fingers into the neck of the bottle to pick it up and turn it around so I got good coverage. When I started this project I was going for the mercury glass look but decided I liked the full coverage better. 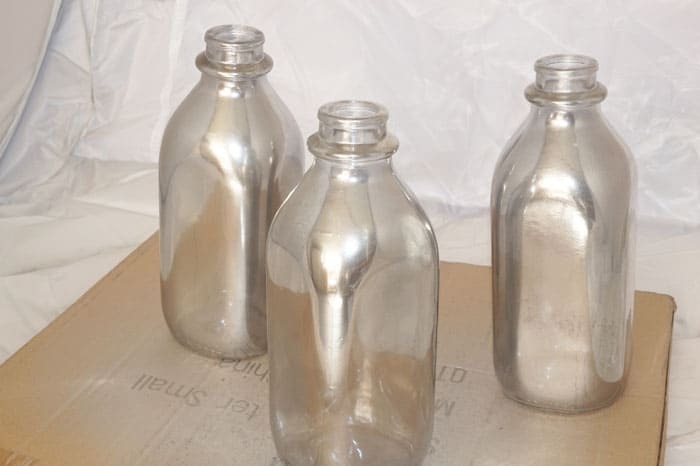 If you’ve never attempted to get the mercury glass look, it’s a good idea to practice on a recycled jar first. Unfortunately I didn’t practice and I wasn’t thrilled with the result I was getting. I do love the look and will try again sometime. While the bottles were drying I set out to find the perfect flowers. I’d bought a funky fake flower arrangement at a garage sale that had good flowers and a cool tub but the arrangement wasn’t for me. In the arrangement were several long stem faux Gerberas that would be perfect. I didn’t want to cut the stems since I might use them elsewhere so I folded them up and tucked them into the bottles. To get them the right height I set the first bottle close to the edge of the table and played with the height until I liked it. Next I folded the stem and slipped it into the bottle. I did the same for the other two bottles; I love how they turned out. When I bought the bottles from a FB treasure group for $5 it was a great deal. Sadly, they had stubborn water deposits that even a vinegar soaking didn’t help. Spraying them with Looking Glass Paint was the perfect solution, now they’re beautiful! 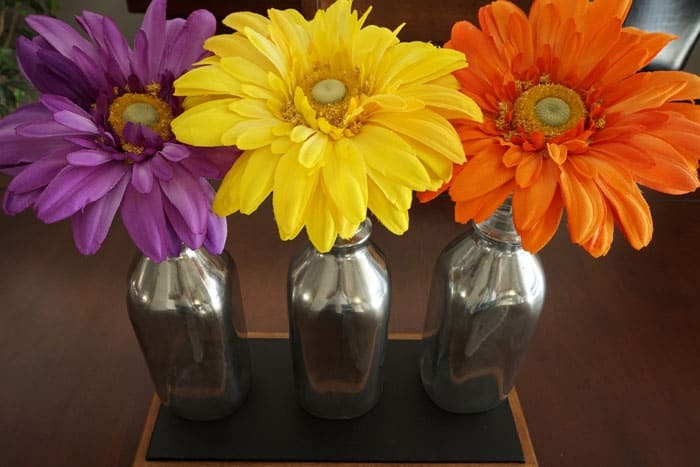 Now this mirrored milk bottle centerpiece is ready for any season. 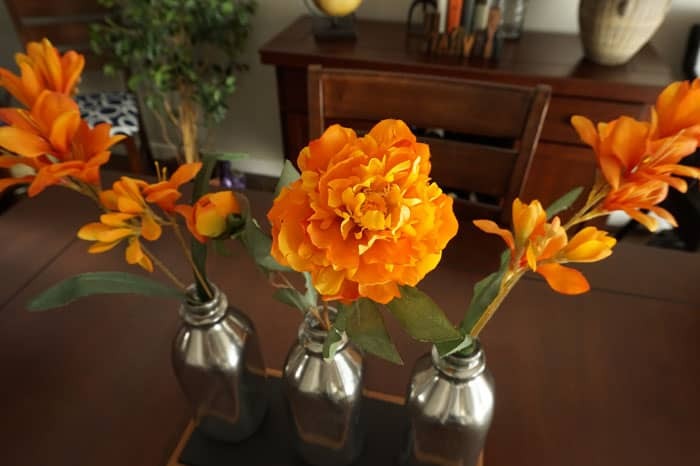 Below I just popped in some fall-colored fake flowers and I’m all ready for Fall. Don’t forget to pin it 🙂 And, don’t forget to follow me on Pinterest for more great decor inspiration! They really are beautiful. I wish I could be as creative as you, very impressed. Oh my gosh, I love them! I have to try this as well. I have some Ball jars I’d love to try this on too. Thanks so much for sharing this beautiful inspiration. It’s stunning! 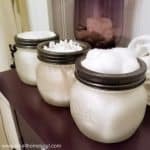 Thank you Carolann, yes get out those jars and paint them. I can’t wait to see! Those are the prettiest bottles I have ever seen painted. They look so much like mercury glass. Just lovely! 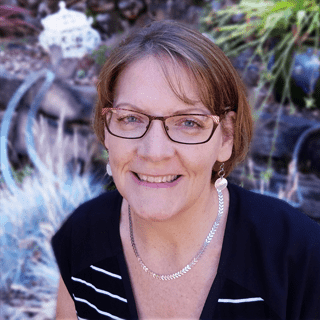 Congratulations, you were selected as our feature this week for this great post. You will be seen on TaDa! Thursdays Link Party #21 this week! Those turned out great!! I just love looking glass spray, I have made several mirrors out of old windows with it 🙂 I have several milk bottles with stuff stuck on the inside that won’t come off no matter what I do, I may have to get out my bottle of spray 🙂 Thanks for sharing at TaDa Thursday!!! Yes Susanne, it’s a perfect solution! And I love the idea of using it for old windows, I’ll have to try it with an old window I have. Great project – the bottles look wonderful! Thank you Carol, they are so much better fancied up! 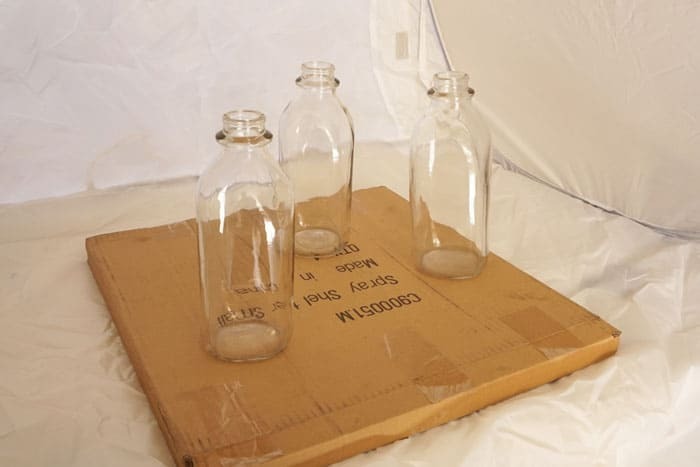 Love these…..and the spray tent was perfect for this project. These turned out so cute!!!!!!! 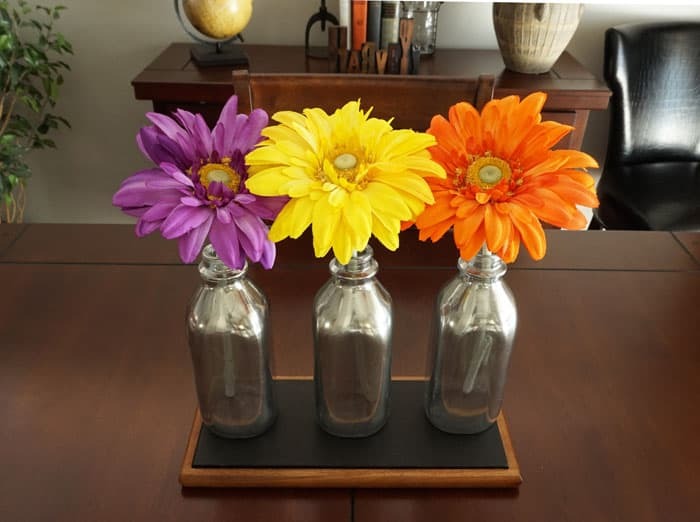 What a fun way to upcycle old bottles!!! Thanks for the idea-? Yay Sam, you will love it! I have only painted a few things so far but I’m hooked!